“Dread of foreign enemies and a series of unsuccessful military adventures abroad, coupled with fear of dissension and conspiracy at home, led to repressive measures and an atmosphere of state paranoia.” Workers who felt that foreign immigrants, coddled by central government policies, were stealing their jobs rioted. “Diseased, wounded veterans,” unable to get medical care, were a scandal. Just across the border, police murdered poor farmers, with the open approval of the government. Fear of hordes of violent, desperate migrants terrified citizens. An alien religion was believed to be plotting the destruction of the national way of life. That was England — and its neighbors, Scotland and France — in the 1590s. Repression that later historians have called a “reign of terror” was imposed. But a few brave voices resisted. Among them was a young actor and aspiring playwright, named Shakespeare, who penned an eloquent appeal on behalf of desperate refugees. Shakespeare was writing for, and perhaps acting in, the most innovative, daring and admired acting company of the time, Lord Strange’s Men. 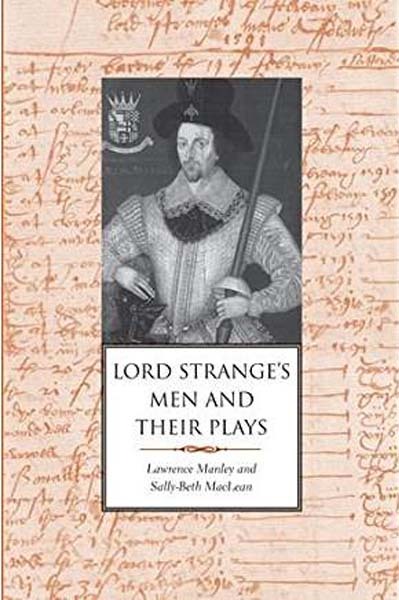 In “Lord Strange’s Men and Their Plays,” Lawrence Manley and Sally-Beth McLean plumb provincial records to place Strange’s Men in a political, religious and social context that goes back to the Wars of the Roses. Strange was the heir of the Earl of Darby, and the earls had used sponsorship of players and entertainers (notably bearwards) for over a hundred years to solidify and encourage their power, which was in the northwest, including a village that grew into the great city of Birmingham. It was a dangerous practice, and Lord Strange was probably murdered for it. His death scattered the best actors and seeded the company of Pembroke’s Men, who literature students associate with Shakespeare’s most controversial years. But Shakespeare wrote “Titus Andronicus” and (at least) two plays about Henry IV for Strange’s Men. Shakespeare, however, is not the star of this show and barely shows up until chapter 9. Before that, we learn an immense amount about the political duel between the Darbies (Catholics as were most of the people in their region) and the Protestant court; about theatrical tours (very important because the London playhouses were closed by plague for much of the history of Strange’s Men; architecture of the provincial halls where they played; how plays were commissioned; how much money they made; how they fell out of the repertory. Strange’s Men introduced a new play about once a mont, which involved a tremendous amount of memorization by the players. Throughout his career, Shakespeare wrote two plays a year, and we must keep in mind that he was memorizing parts of about 10 or 12 new plays, plus acting, all the while. Manley and McLean provide readings of the plays of the early ’90s that make them more political than they Appear to modern readers, but they also note the entertainment values.